Beautiful, tasty and pleasant ~ made with seasonal ingredients. 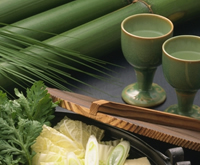 Kyo-Kaiseki ~ 12 dishes offered with a bamboo shoot dish and seasonal vegetables from Kyoto. Another way to call the Gion Matsuri Festival is the “Pike Conger Festival”. 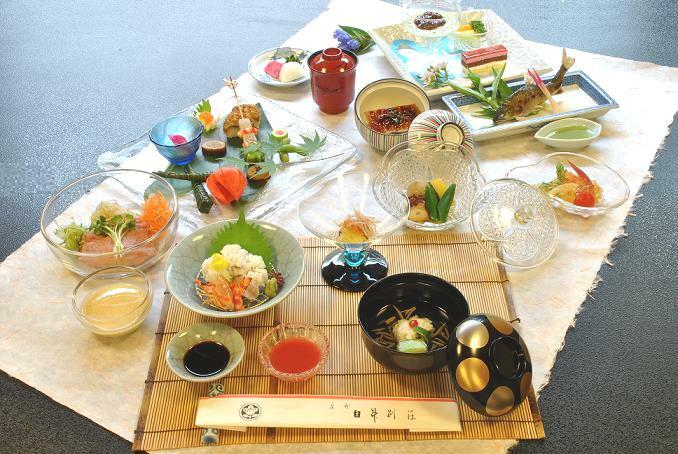 Kyo-Kaiseki ~ 12 dishes offered with “pike conger dishes” which is highly recommended to try while visiting Kyoto. Best season to present matsutake mushrooms along with the autumn leaves. Kyo-Kaiseki ~ 12 dishes offered with matsutake mushrooms to experience the fall season. Please relax and enjoy “Kamo nabe” (duck hot pot) that wams your body accompanied with alcohol provided in the room. Dinner is served in the room and breakfast is provided at the banquet hall with a view of the courtyard. Reservations can be made for two people or more. Available for 2 or more people. We also accept reservations for banquets by phone. Service fee is included.